Word is out that Instagram has just released its latest feature, Instagram Stories. Yes, you guessed it – it’s the almost identical twin of Snapchat Stories. 1. Worried About Ruining Your Pretty Instagram Grid? Don’t. Let’s be honest – with the coming of Instagram came the birth of #aestheticgoals. We edit our photos to death trying to create/curate the perfect grid, and the photo albums in our phones are full of images that never quite make the cut. It’s like they say – Instagram is the highlight reel of our lives… if the lighting conditions and composition are exactly right. When we post with such stringent requirements, it also means we tend to post less often. That means people either create an ugly Instagram for life’s less photogenic moments (yes, that’s what the kids are doing these days), or they turn to Snapchat to post their more fun, unfiltered content. With Instagram rolling out Snapchat-style available-for-one-day-only type posting, it looks like that’s about to change – and at zero expense to our carefully curated Instagram grids. Just like on Snapchat, everything you post will be permanently deleted in 24 hours – at least that’s what they say. I, for one, have my doubts about things you post online ever being truly “gone”. Snapchatters, you know the drill! And for those of you who don’t, there’s a 10 second cap on the videos you take, but don’t worry, you’ll get used to it! Plus, if Snapchat is any indication to go by, 10 seconds is all you really need. Love embellishing your snaps with silly text and your less than stellar artwork? These features will all be coming to you on Instagram, and with an added bonus – 3 brushes to draw with, instead of Snapchat’s 1. In addition to the standard brush, there will also be a translucent highlighter one and a colour-outlined neon brush. On the filter front, only colour filters have been mentioned so far. Will these give Snapchat filters a run for their money? Seeing that they’re not going to be augmented reality filters, maybe not – once you go augmented reality, you can’t quite go back. Also, there will be no 3D stickers or speed effects, which is a huge bummer. But who knows, Instagram might just decide to roll them out in future – I have my fingers crossed for that to happen. 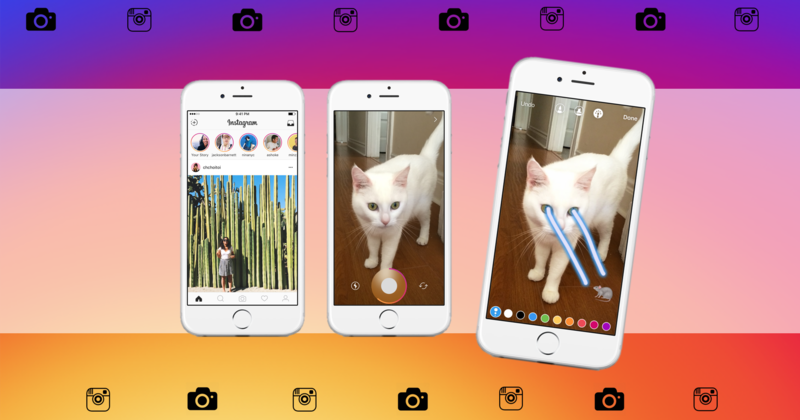 When we said Instagram stories were going to be almost identical twins to that of Snapchat, we weren’t joking. Instagram also lets you filter out people you don’t want seeing what you’re getting up to. No creepy stalkers, no pesky ex-es – you can block specific individuals from viewing your story. Heck, you can keep your circle small by keeping your profile private, in which case, only your followers can view your stories. Otherwise, turn your privacy settings to public and they’re visible to everybody – with the exception of those you’ve blocked off, of course. Now, this is where Instagram and Snapchat diverge. You will receive NO notification if someone takes a screenshot of a part of your story. If you’re not someone who embarrasses easily, this will hardly bother you. But for those of you with A+ friends with a habit of using your less than glamorous moments against you… You never know who’s got what terrible photo of you. A heads up to all you girls who like downloading your Snapchat stories – with Instagram, you unfortunately will NOT be able to download and save your day’s story for future reference. You will, however, be able to save some slides (i.e Instagram’s version of a single snap) to your Instagram. 9. Wait…So What’ll My Insta-Feed Look Like? We’re getting there. Your friends’ Instagram stories will appear at the top of your Insta-feed in coloured rings – you’ll have to click on your friends’ profile images to know what’s up. Beyond that, it appears your Instagram feed will look pretty much the same. 10. Snapchatters Have More Fun? Perhaps Not Anymore. It’s probably safe to say that more of us have an Instagram account than a Snapchat one. Maybe you’re not a big Snapper, you don’t have a big enough following for there to be a point snapping, or you’re so late to the party you’ve decided to give up on joining at all. Whatever the reason, this major change will mean that those of you who are more active ‘grammers will be able to enjoy nearly all the features of Snapchat on a platform you’re already at home on. Have you tried out the new features? What do you think about them? This article originally appeared on Unzippedtv, and was written by Sonia Pasupathy. Singapore Businesses To Use “Lure” On Pokemon GO Players! Will It Be Super Effective?